Annual Civil War Weekend--Victory of Rowlesburg! On Saturday, May 1st, Rowlesburg once again celebrates its great Civil War victory with tours of the entire battle site, including Cannon Hill, a Ladies Tea, the Civil War Victory Banquet, and on Sunday a Civil War Reenactment of the Battle. Special banquet guest speaker, Dr. Mike Workman, will discuss the importance of the victory. The Civil War banquet is being held this year as a fundraiser for the Rowlesburg Ambulance Service. BIG BUCKS BINGO will immediately follow the banquet. Tickets for the banquet and bingo will be $16.00. The Ladies Tea is to be served at the United Methodist Church starting at 12:00 noon. Dress code is formal (hat and gloves) or Period (Civil War). The Big Reenactment of the Rowlesburg Battle is Saturday at 2:00 pm in the Rowlesburg Park. The celebration is topped off on Sunday morning, May 2nd with a big buckwheat breakfast served by the wonderful chefs of the VFW Ladies Auxiliary, followed by church services at the United Methodist Church at 11:00 am. This year funds from the breakfast will be donated to the Relay for Life program. For additional information about the Ladies Tea, please call Pat Mick at 304-454-2442, or Mary Ellen Wiles at 304-454-9656. For information and tickets to the banquet and Big Bucks Bingo, please call Kathy Sines at 304-454-9391. Tickets are available for the banquet at the Clear Mountain Bank in Rowlesburg. Tickets for the Sunday breakfast will be sold at the door. The West Virginia Reenactors Association will have up to 40 Union, Confederate and civilian reenactors in Rowlesburg on Saturday, May 1st. For the reenactment events at Rowlesburg, Union and Confederate camps will be set up in the Rowlesburg Park with tents, straw for bedding, campfires, and hay and water for horses. Camps will be as authentic to 1863 camps as possible, with little or no modern conveniences. Visitors are welcome to tour the campsites all day on Saturday. During the battle reenactment, Union soldiers will be barricaded behind railroad ties to defend the railroad bridge against confederate soldiers intent on destroying the main link of the B&O to the Ohio. Weapons will be fired during the reenactment. The Rebels will fail just as they did in 1863. There will be casualties. In addition, cannons will be fired, one possibly stationed atop Cannon Hill to announce the beginning of the Battle of Rowlesburg. For more information about the Reenactment visit http://www.wvra.org. What is all of this celebrating about? On April 26, 1863, a handful of determined Union troops and Rowlesburg townspeople defeated the Confederate Raiders led by General W.E. Jones, who was handpicked by Robert E. Lee to destroy the B&O Railroad link to the Ohio. Lee would say that to destroy the Cheat River Bridge alone would be "worth to him an army." To the Federal side preserving "Lincoln's Lifeline" was of equal importance. The bridges crossing Cheat River and Tray Run in Rowlesburg were critical to both sides because their destruction would halt rail traffic all the way to the Ohio. Jones was defeated utterly at Rowlesburg although his troops far outnumbered the small band of defenders. Jones would retreat and move on toward Fairmont, another target that would fall to the Confederate Raiders. His Raiders wrecked havoc all along their trail, but Rowlesburg was the only town or outpost in western Virginia that was a principal target of the raid to stand up to the Confederate onslaught and emerge unscathed. "Lincoln's Lifeline" was preserved. During the Battle of Greenland Gap on April 25, 1863 Confederate General Jones ordered a church burnt to the ground in order to dislodge a stubborn Union force. Click on photo to go back to HOME page. The crowd lines up in the Park to observe the Battle of Rowlesburg. In this scene Union troops open fire on Confederate Raiders attempting to destroy the railroad bridge. 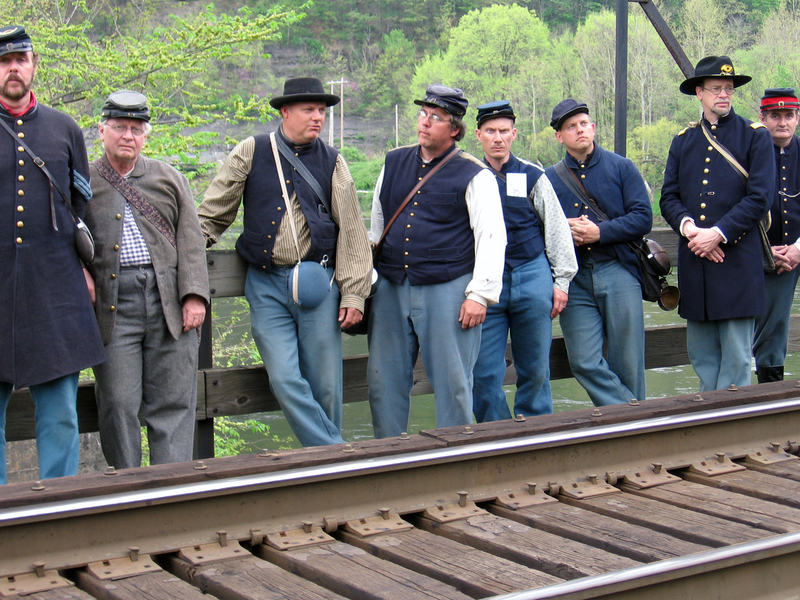 Members of the WVRA stand on the railroad bridge the Confederates attempted to destroy during the Battle of Rowlesburg, April 26, 1863. The huge quilt show at the VFW was a smash hit. The quilts were locally made. Also on display was a spinning wheel operated by the famous area seamstress and quilter, Ms. Bessie Short. Adding to the history and color of the the weekend, buggy rides are provided by the Amish of Oakland, MD. 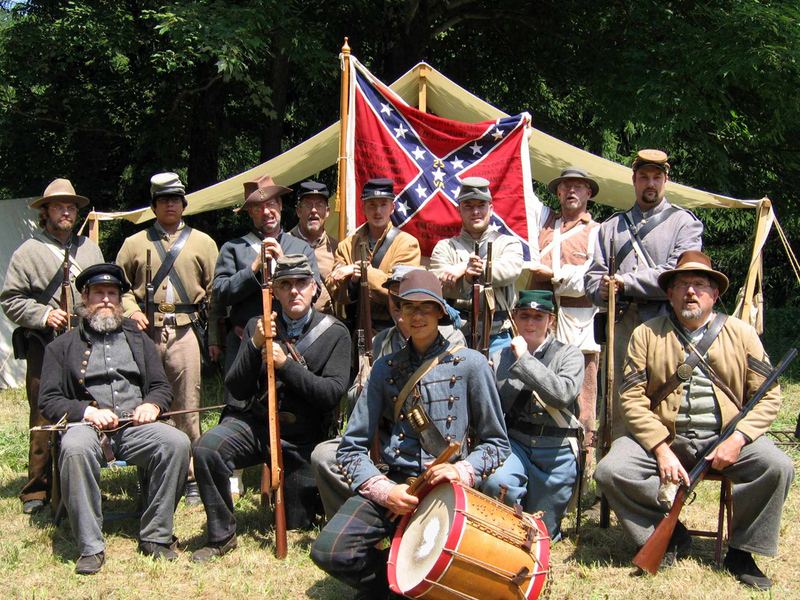 WVRA reenactors pose in front of one of their tents. This part of the reenactors group represent confederate raiders. .